Police in Brazil are looking for the killers of six teenagers who were murdered in Rio de Janeiro after going to bathe in a local waterfall. They believe the six young men were killed by drug lords from the nearby Chatuba district. "The drug gangs probably wanted to make a show of force to the authorities," said police officer Sandra Ornelas. The bodies, displaying signs of torture, were found on a road that is being widened for the 2016 Olympics. Critics say the crimes show that the authorities in Brazil still have a long way to go to reduce violence to acceptable levels for the Games, which Rio will host. 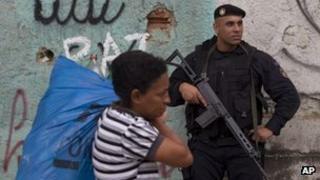 Many of Rio's biggest slum areas, or favelas, have been occupied by police and the army as part of a "pacification programme" ahead of the 2014 football World Cup and the Olympics. But in many cases the drug lords have moved from the wealthier central areas of the city to the outskirts, where violence was already rife. Rio de Janeiro city and state authorities say their "pacification programme" has managed to reduce violence and restore the dignity of hundreds of thousands of people who live in the city's poorer quarters. The bodies of the six young men, aged between 16 and 19, were found on Monday morning in Mesquita, on the outskirts of Rio. They had been missing since Saturday, and family members had tried in vain to contact them, dialling their mobile phones. "We believe these boys were at the wrong place at the wrong time," said Ms Ornelas, the officer in charge of the case. She said they had no criminal records and were not involved in any way with the drug gangs. "A local religious leader tried to make contact with the criminals after they were kidnapped on Saturday, but he was told the six would be killed. "I believe the criminals murdered them to send a message to the police, to show they are still powerful," said Ms Ornelas. The police are now planning to carry out operations in nearby districts to chase the killers.